A Chic Patio Sanctuary In Toronto By Joel Loblaw Inc.
As Torontonians begrudgingly accept that summer is coming to an close, they're feeling compelled to take advantage of every last sun-soaked moment. Ontarions, smelling the hint of Autumn crispness in the air, are relishing their time outdoors with friends and family. 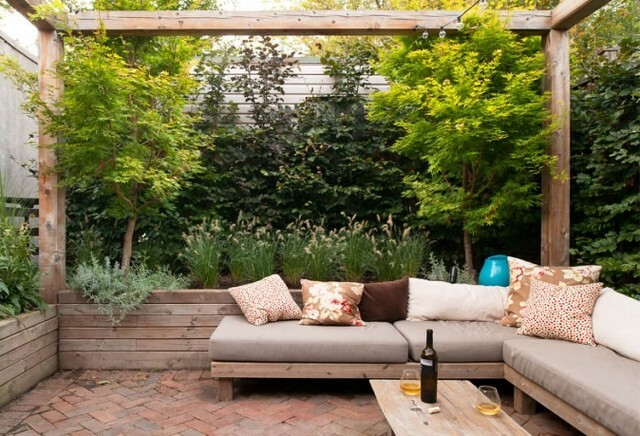 Located in Toronto's Leslieville neighbourhood, this enchanting patio designed by landscape architecture firm Joel Loblaw Inc. brings nature to the city centre. Image Courtesy of Brenda Liu and Joel Loblaw Inc.
Aptly called ‘Seeking Sanctuary’, this nature-inspired retreat buffers the bustle of everyday urban life. Elongated contemporary outdoor seating and a rustic timber table take centre stage on a square sunken patio of herringbone clay brick under a post-and-beam arbor. I adore the juxtaposition between the built form and its pastoral surroundings. At night, the strands of lights - and cleverly placed uplighting - transform the setting into a chill lounge environment. Image Courtesy of Brenda Liu, source: Joel Loblaw Inc. Surrounded by a canopy of trees, vines, tall grasses, and Japanese Maples screen the neighbouring buildings and fencing to infuse a more pastoral setting. Here's a link to learn more about landscape architecture firm Joel Loblaw Inc. Researched and Written by Gorana Tolja, Graduate of the Ryerson School of Interior Design & MA Graduate from the Contemporary Art, Design and New Media Art Histories program at OCAD University. Life on the Rocks in Tofino, BC.